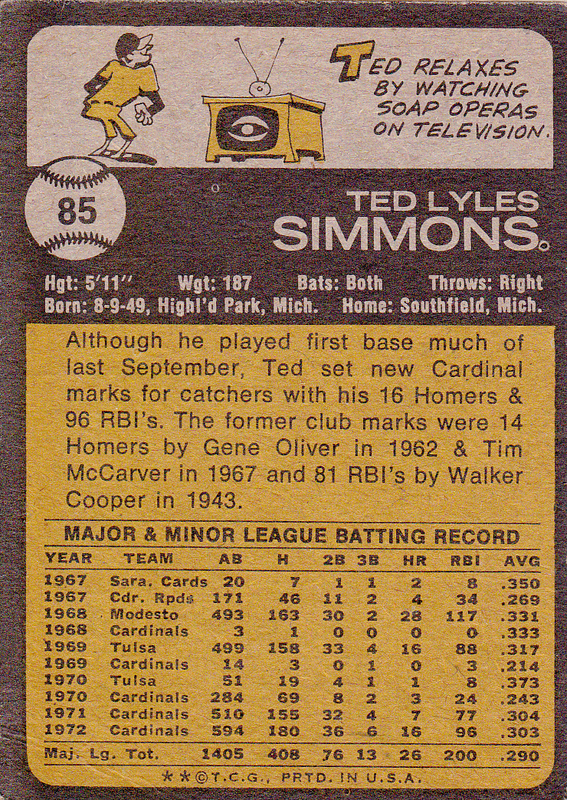 T ed Lyle Simmons (born August 9, 1949 in Highland Park, Michigan) is an American former professional baseball player and coach. Simmons was a catcher for most of his Major League Baseball career with the St. Louis Cardinals, the Milwaukee Brewers and the Atlanta Braves. He was often overshadowed by Johnny Bench, Simmons is considered one of the best hitting catchers in Major League baseball history. He didn’t possess Bench’s power hitting ability, but he hit for a higher batting average. Simmons was selected by the St. Louis Cardinals as their first round pick in the 1967 Major League Baseball Draft. He made his major league debut with the Cardinals, appearing in two games during the 1968 pennant-winning season. Simmons spent another year in Triple-A baseball before returning to the major leagues in 1970. He finished 16th in balloting for the 1971 National League Most Valuable Player Award as the Cardinals finished in second place behind the Pittsburgh Pirates in the National League Eastern Division. An eight-time All-Star, he batted above .300 seven times, reached 20 home runs six times, and eight times exceeded 90 runs batted in. He switch-hit home runs in a game three times and established a since-broken National League career record for home runs by a switch-hitter (182). 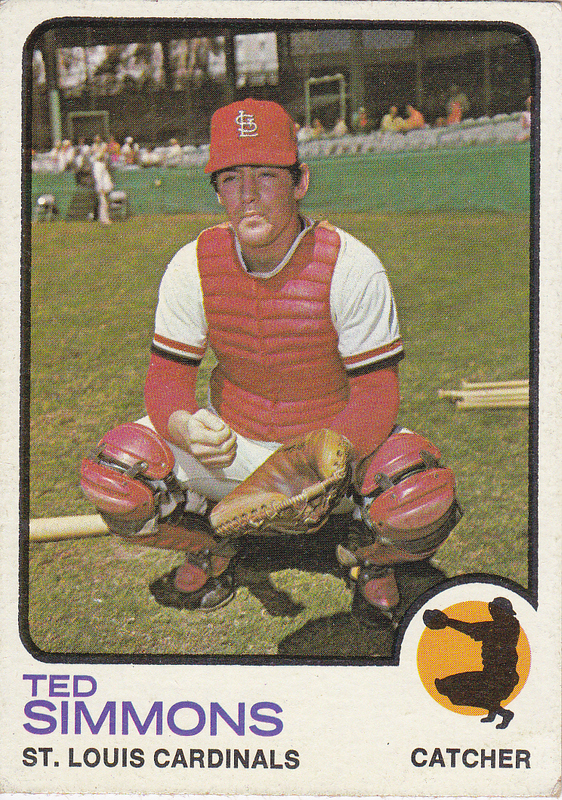 Posted in 1973, 1973 Topps, Cardinals, Catcher, St. Louis Cardinals. Bookmark the permalink. Albert Fred “Red” Schoendienst (born February 2, 1923) is an American Major League Baseball coach, former player and manager, and 10-time All-star. After a 19-year playing career with the St. Louis Cardinals (1945–56, 1961–63), New York Giants (1956–57) and Milwaukee Braves (1957–60), Schoendienst managed the Cardinals from 1965 through 1976, the second-longest managerial tenure in the team’s history (behind Tony La Russa’s). Under his direction St. Louis won the 1967 and 1968 National League pennants and the 1967 World Series, and Schoendienst was named National League Manager of the Year in both ’67 and ’68. He was elected to the Baseball Hall of Fame in 1989 by the Veterans Committee. Schoendienst remains with the Cardinals as Special Assistant Coach; as of 2011 he has worn a Major League uniform as a player, coach or manager for 66 consecutive seasons. Red Schoendienst was elected to the Baseball Hall of Fame in 1989 by the Veterans Committee, and the Cardinals retired his number (2) in 1990. In 1998 he was inducted into the St. Louis Walk of Fame. 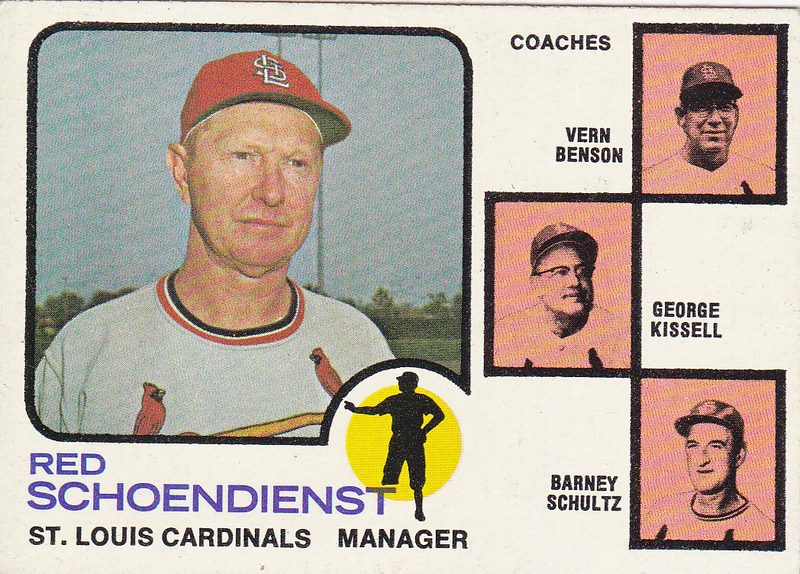 Posted in 1973, 1973 Topps, Cardinals, Manager, St. Louis Cardinals. Bookmark the permalink. The St. Louis Cardinals are a professional baseball team based in St. Louis, Missouri. They are members of the Central Division in the National League of Major League Baseball. The Cardinals have won eleven World Series championships, the most of any National League team, and second overall only to the New York Yankees, who have won twenty-seven. They have played in eighteen. They are the defending World Series champions, having won the 2011 World Series in seven games over the Texas Rangers. The Cardinals were founded in the American Association in 1882 as the St. Louis Brown Stockings, taking the name from an earlier National League team. They joined the National League in 1892 and have been known as the Cardinals since 1900. The club quickly achieved success, winning four AA pennants in a row in 1885–1888. St. Louis played in an early version of the World Series, the first two times against the National League’s Chicago White Stockings, now named the Chicago Cubs. The 1885 series ended in dispute, but St. Louis won the 1886 series outright, beginning a St. Louis-Chicago rivalry that continues today. The American Association went bankrupt in 1892, and the Browns moved to the National League, leaving much of their success behind for the next three decades. 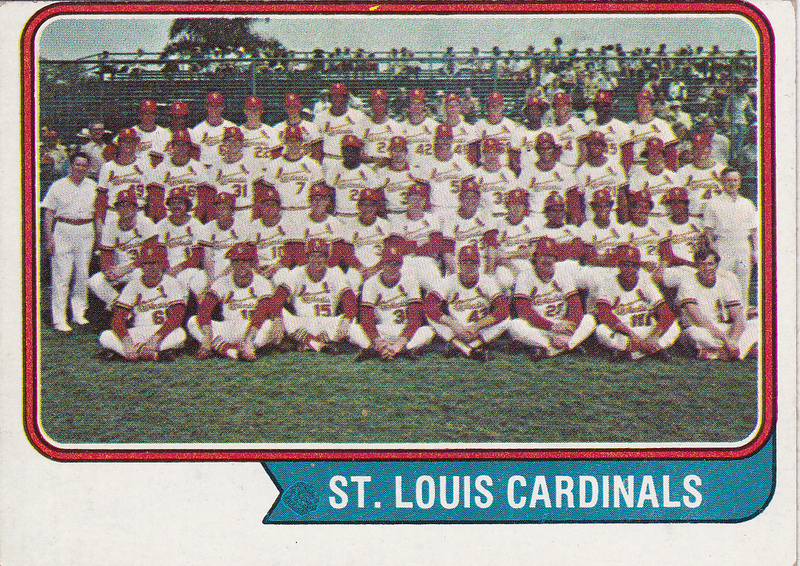 Posted in 1974, 1974 Team Photo, 1974 Topps, Cardinals, St. Louis Cardinals. Bookmark the permalink. The St. Louis Cardinals were founded in 1882 as a member of the American Association called the St. Louis Brown Stockings. The club quickly achieved success, winning four AA pennants in a row in 1885–1888. St. Louis played in an early version of the World Series, the first two times against the National League’s Chicago White Stockings, now named the Chicago Cubs. The 1885 series ended in dispute, but St. Louis won the 1886 series outright, beginning a St. Louis-Chicago rivalry that continues today. The American Association went bankrupt in 1892, and the Browns moved to the National League, leaving much of their success behind for the next three decades. The club changed its name to the “Perfectos” in 1899, before adopting the “Cardinals” name in 1900. From 1902–1954, an American League team, the St. Louis Browns, also played in St. Louis. The Browns moved to Baltimore in 1954 and became the Baltimore Orioles. The Cardinals’ fortunes in the National League began to improve in 1920, when Sam Breadon bought the club and named Branch Rickey his general manager. Rickey immediately moved the Cardinals to Sportsman’s Park to become tenants of their American League rivals, the St. Louis Browns, and sold the Cardinals’ ballpark. 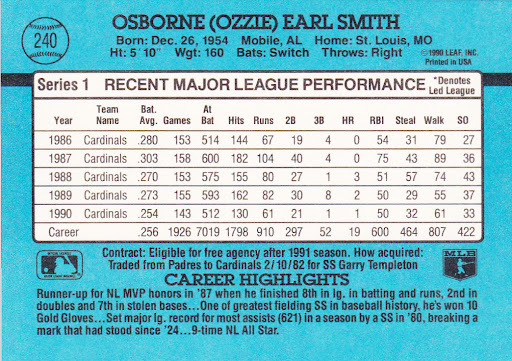 Rickey used the money from the sale to invest in and pioneer the minor league farm system, which produced many great players and led to new success for the Cardinals. Led by Rogers Hornsby, who won the Triple Crown in both 1922 and 1925, the Cardinals improved dramatically during the 1920s. They won their first National League pennant in 1926 and then defeated the favored New York Yankees in seven games to win the World Series. In 1927, now led by Frankie Frisch, the Cardinals fell just short, before claiming another pennant in 1928. 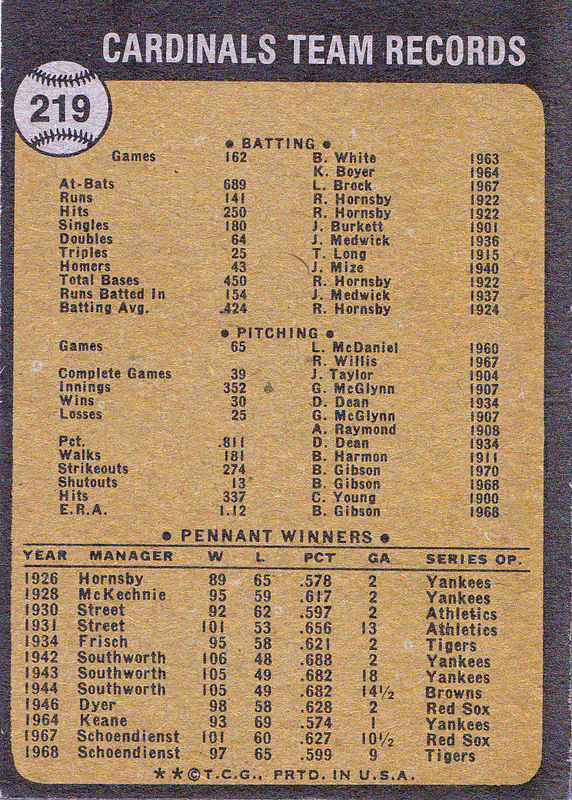 The Cardinals kept winning in the next decade, claiming back-to-back pennants in 1930 and 1931. The Cardinals matched up with the Philadelphia Athletics in both World Series, losing in 1930 but returning to win the 1931 series. In 1934 the team, nicknamed the “Gashouse Gang” for their shabby appearance and rough tactics, again won the pennant and then the World Series over the Detroit Tigers. 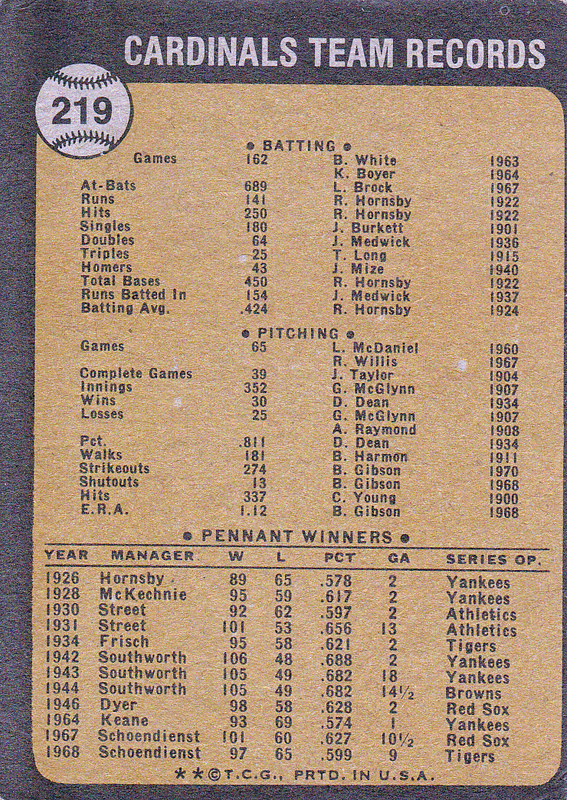 Dizzy Dean won 30 games that season, the last National League pitcher to reach that mark. Joe Medwick won the Triple Crown in 1937, the last National League hitter to achieve the feat, but the Cardinals failed to win a pennant in the second half of the decade. 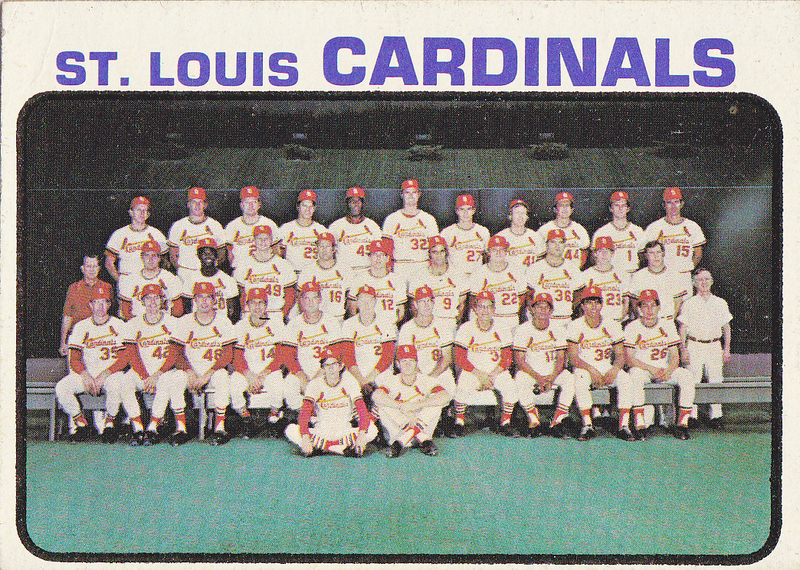 Posted in 1973, 1973 Team Photo, 1973 Topps, Cardinals, St. Louis Cardinals. Bookmark the permalink. 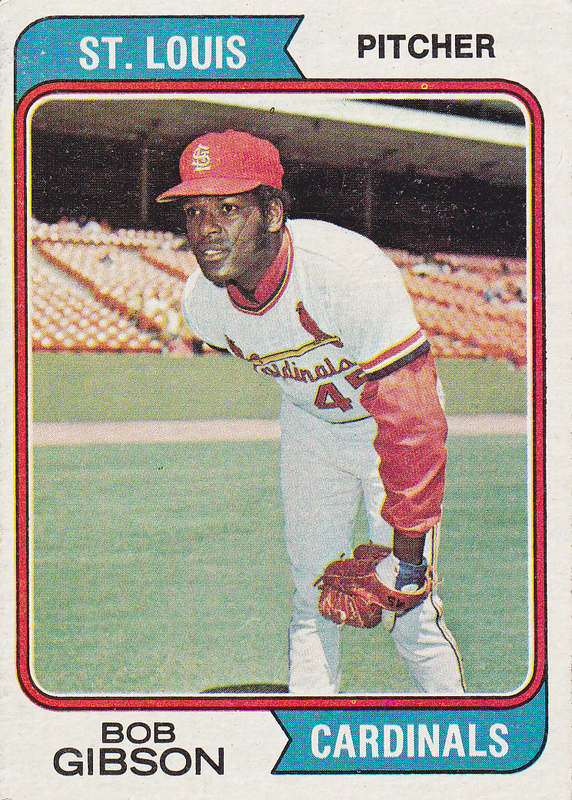 Robert “Bob” Gibson (born November 9, 1935) is a retired American professional baseball player. Nicknamed “Hoot” and “Gibby”, he was a right-handed pitcher who played his entire 17-year Major League Baseball career with St. Louis Cardinals (1959–1975). A nine-time All-Star selection, Gibson accumulated 3,117 strikeouts during his career, won two Cy Young Awards, was named the National League’s Most Valuable Player (MVP) in 1968, and was a member of two World Series championship teams. He was elected to the Baseball Hall of Fame in 1981, his first year of eligibility. Gibson was the starting pitcher in nine World Series games during his career, in which he recorded eight complete games and seven wins. 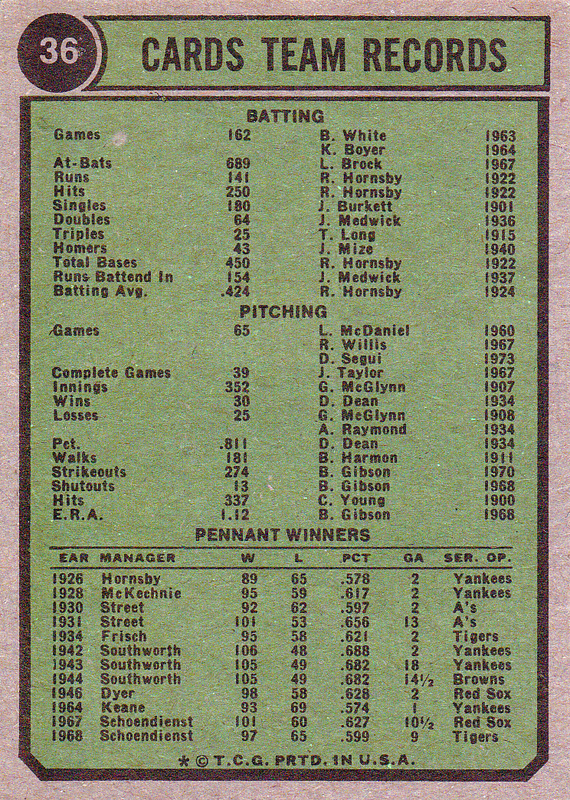 Gibson also set a World Series record by posting 17 strikeouts during Game 1 of the 1968 World Series. After retiring as a player in 1975, Gibson later served as pitching coach for his former teammate Joe Torre. 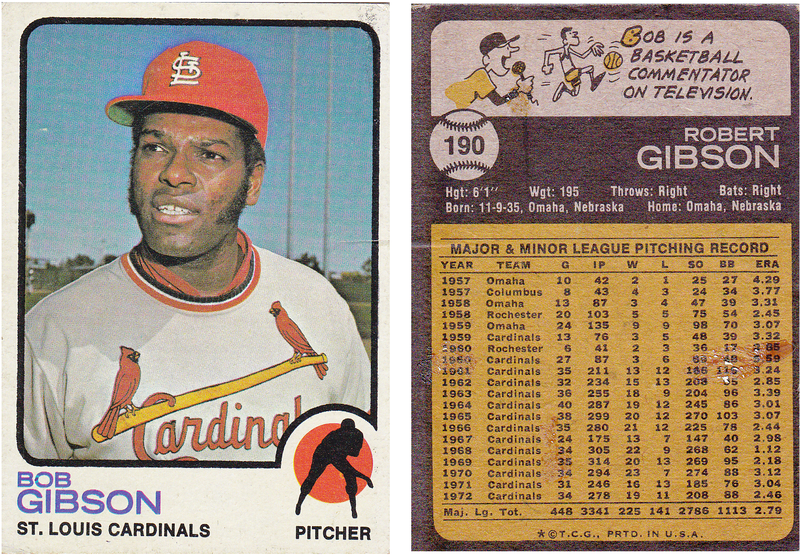 At one time a special instructor coach for the St. Louis Cardinals as well, Gibson was later selected for the Major League Baseball All-Century Team in 1999. 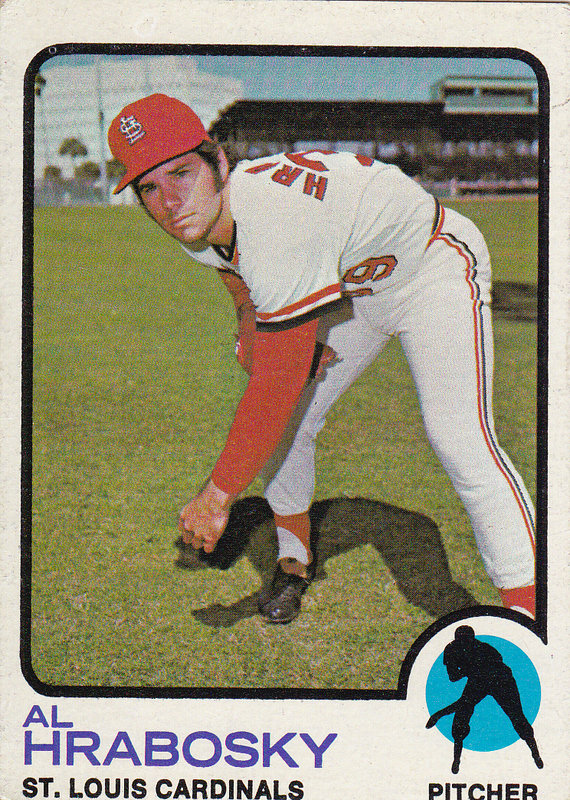 Posted in 1974, 1974 Topps, Cardinals, Pitcher, St. Louis Cardinals. Bookmark the permalink. The Cardinals were founded in 1882 as a member of the American Association called the St. Louis Brown Stockings. The club quickly achieved success, winning four AA pennants in a row in 1885–1888. St. Louis played in an early version of the World Series, the first two times against the National League’s Chicago White Stockings, now named the Chicago Cubs. The 1885 series ended in dispute, but St. Louis won the 1886 series outright, beginning a St. Louis-Chicago rivalry that continues today. The American Association went bankrupt in 1892, and the Browns moved to the National League, leaving much of their success behind for the next three decades. The club changed its name to the “Perfectos” in 1899, before adopting the “Cardinals” name in 1900. 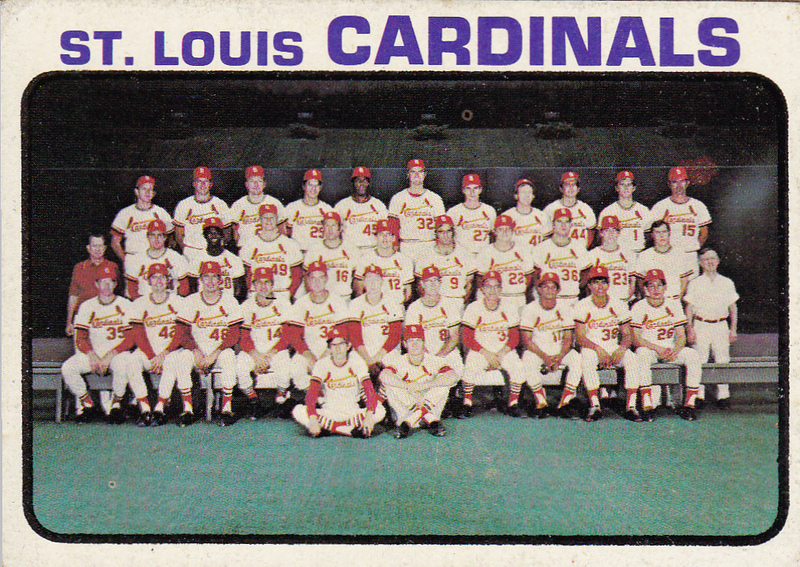 Posted in 1973, 1973 Topps, Cardinals, St. Louis Cardinals, Team. Bookmark the permalink. 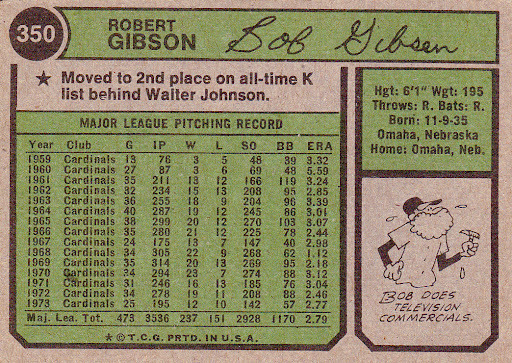 Robert “Bob” Gibson(born November 9, 1935) is a retired American professional baseball player. Nicknamed “Hoot” and “Gibby”, he was a right-handed pitcher who played his entire 17-year Major League Baseball career with St. Louis Cardinals (1959–1975). A nine-time All-Star selection, Gibson accumulated 3,117 strikeouts during his career, won two Cy Young Awards, was named the National League’s Most Valuable Player (MVP) in 1968, and was a member of two World Series championship teams. He was elected to the Baseball Hall of Fame in 1981, his first year of eligibility. 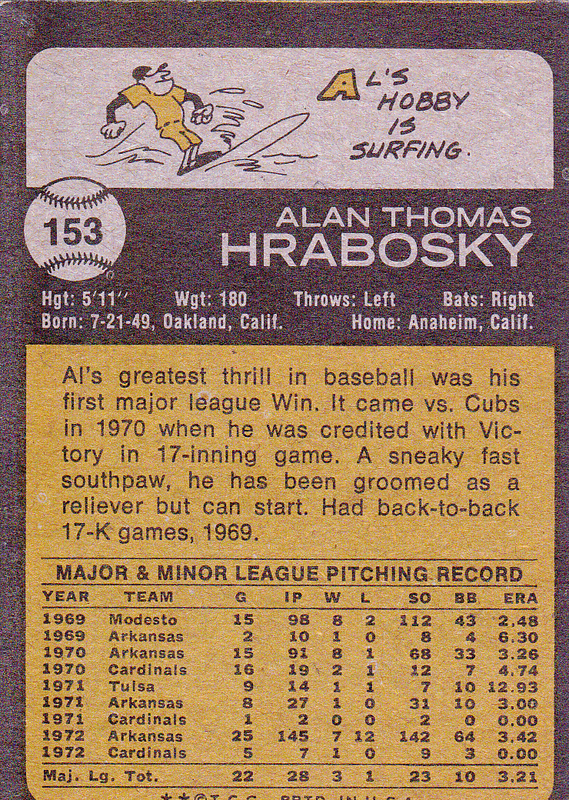 Posted in 1973, 1973 Topps, Cardinals, Pitcher, St. Louis Cardinals, Uncategorized. Bookmark the permalink. Louis Clark “Lou” Brock(born June 18, 1939) is a former American professional baseball player. He began his Major League Baseball career with the Chicago Cubs but, spent the majority of his career as the left fielder for the St. Louis Cardinals. Brock was best known for breaking Ty Cobb’s all-time major league stolen base record. He is currently a special instructor coach for the St. Louis Cardinals. Brock was inducted into the Baseball Hall of Fame in 1985. 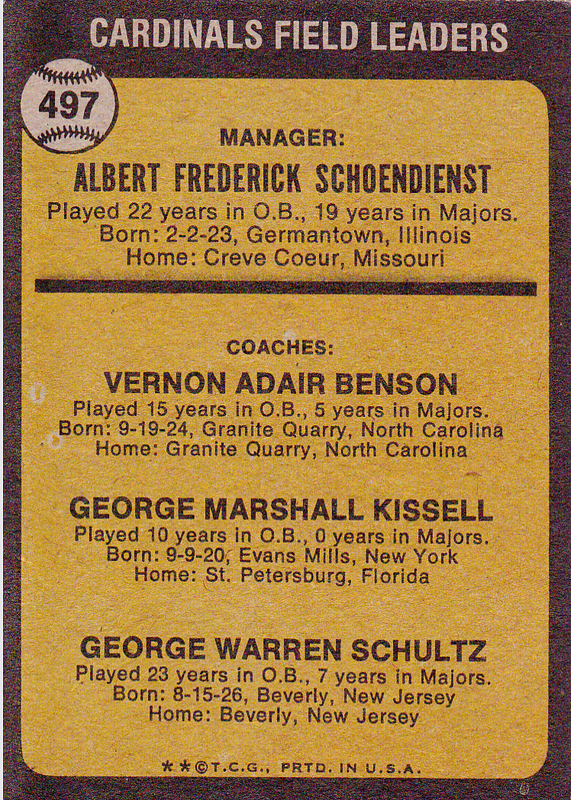 Posted in 1973, 1973 Topps, Cardinals, Outfield, St. Louis Cardinals. Bookmark the permalink.